“Bold leader of this vast array, Saint Robert, intercede today. God grant us hearts to dream anew, and strength his kingdom to pursue. Fond lover of that hallowed place, where brothers lived as one by grace, Saint Alberic, pray we may be one heart, one mind, in unity. You may be aware that these saints are not honored on the Roman liturgical calendar, but revered by the monks and nuns of the Cistercian and Benedictine monasteries, are the three holy founders of Citeaux (near Dijon, France): Saints Robert Molesme (centered in the image), Stephen Harding and Alberic. 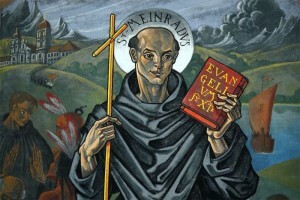 They began their reform of Benedictine life in 1098. The Cistercian movement is now venerable but when it was started it was very contentious as you might expect –anytime you ask people to change you run against the tide. Think of the Prophets, or in particular, the Prophet Jonah of yesterday’s reading at Mass. Let us pray for our own conversion, and that of the Church. But also for God’s abundant grace to fall on those who have made profession to the charism of Citeaux –monks, nuns, and the laity. The early Cistercians, impelled by a burning thirst for authenticity, wished to interpret the Rule (of St. Benedict) in the light of its monastic background and to recover its original simplicity. Their life was marked by a real detachment from the world, a love of solitude and silence, poverty and simplicity, austerity and manual labor, prayer and holy reading, all within a cenobitic framework which laid great stress upon the value of fraternal charity in the common life. There is an attractive genuinity about this reform, which was not merely an archeologizing return to the past, but a recapturing of the primitive monastic ideal and an attempt, largely successful, to express it in structures suitable to the times. The school of spirituality which the white monks produced, dominated by St. Bernard, is no less notable for its charming huamanity than for its authentically contemplative orientation. Today, the Benedictine liturgical calendar recalls for us the life and martyrdom of Saint Meinrad (+861) –the Apostle for Hospitality. Meinrad was a Swiss hermit. His life can be read here. Join me in praying for those whose mission it is to offer hospitality (and who are often wounded in doing so), for the monastic community and oblates of the venerable Archabbey of Saint Meinrad in Indiana. Today is the Feast Day of Blessed Cyprian Michael Iwene Tansi. In the USA we don’t liturgically have Blessed Cyprian on the calendar, but we ought to know about him and follow his example. First a secular priest and then a Trappist monk Tansi has a unique vocation of looking at both the interior life and the apostolate with new eyes. He is Nigeria’s patron saint. Born to non-Christian parents in September 1903, Blessed Cyprian Michael Iwene Tansi was born in Aguleri, Anambra State, Nigeria. In 1909, he was sent to live with his uncle who was a Christian gave him an education. He was baptised 3 years later by Irish missionaries. Tansi was a diligent student with a precocious personality and deep piety. He worked as a teacher for 3 years and later served as a headmaster of St. Joseph’s school for one year in Aguleri. 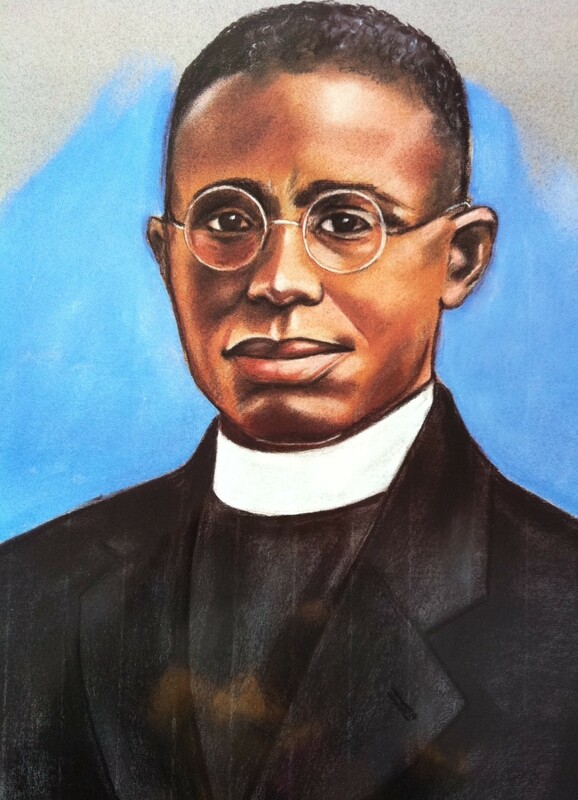 In 1925 against the wishes of his family, he entered St. Paul’s Seminary in Igbariam and was ordained a priest in the Cathedral of Onitsha on 19 December 1937. For a time Tansi worked tirelessly in the parishes of Nnewi, Dunukofia, Akpu/Ajali before discerning vocation to be a Cistercian monk at Mount Saint Bernard Abbey, Leicester, England. He lived this vocation at the abbey for 14 years. He was in the process of discerning becoming the novice master in a new Cistercian foundation in Cameroon, a few months after the founders left for Africa. Father Tansi used to say, “if you are going to be a Christian at all, you might as well live entirely for God”. He was first of all a man of God: his long hours before the Blessed Sacrament filled his heart with generous and courageous love. Those who knew him testify to his great love of God. Everyone who met him was touched by his personal goodness. He was then a man of the people: he always put others before himself, and was especially attentive to the pastoral needs of families. He took great care to prepare couples well for Holy Matrimony and preached the importance of chastity. He tried in every way to promote the dignity of women. In a special way, the education of young people was precious to him. Blessed Cyprian, during your life on earth you showed your great faith and love in giving yourself to your people and by the hidden life of prayer and contemplation. Look upon us now in our needs, and intercede for us with the Lord. May he grant us the favour we ask through our prayers. Amen. Fr. Gregory Wareing, A New Life of Father Cyprian Michael Iwene Tansi (Coalville, Leicester LE6 3UL: Mt. St. Bernard Abbey. 1994). Father Gregory was Blessed Cyprian’s Novice Master. Veronica Onyedika Chidi Umegakwe, Footprints of Father Tansi: The Tomb is not his Goal (Awhum, Nigeria: Our Lady of Calvary Monastery, 1993). The life of Blessed Cyprian is here presented in a five act play by the chief coordinator of the Father Tansi Lay Contemplative Prayer Movement. Elisabeth Isichei, Entirely for God. The life of Cyprian Michael Iwene Tansi (Kalamazoo: Cistercian Studies Series 43, 1980 and 2000). Dom John Moakler, “Some Thoughts about Blessed Cyprian Tansi” in Hallel 25 (2000), pp.79-93. 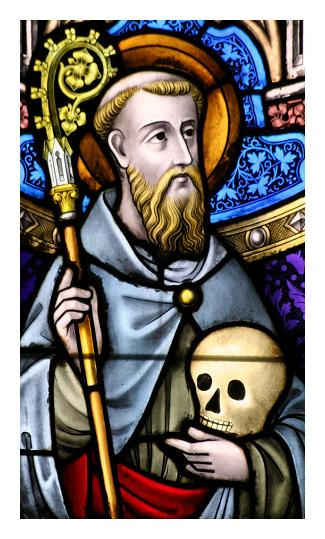 Saint Odilo of Cluny (962-1049) is remembered for his intense Benedictine life at Cluny and as the 5th abbot of Cluny he oversaw the expansion of the Cluniac reform but he’s best remembered for his concern for he poor souls in purgatory. There is some debate if he was the 5th or the 3rd abbot of Cluny. However, Odilo’s importance lies in the fact that he instituted the commemoration of All Souls (c. 1030) as a yearly liturgical remembrance. The Church from the earliest days prayed for the dead with some regularity. Theologically he had a significant interest in the Incarnation. Hence two things of Christian life had Saint Odilo’s attention: the care of the poor and the souls of the dead. Of the latter concern also impacted the prior –he decreed that Mass be offered and a monetary offering be made for the poor. He made almsgiving connect with fasting and prayer for the dead: it is not only a lenten piece of Christian spirituality but something that gives a renewed flavor to living the gospel. Odilo instructed that the offering of food given to twelve poor people (as much food as the monks would eat at the main meal). Regarding the monastic life, Abbot Odilo showed great solicitude for the observance of the monastic life by visiting the monasteries under his guidance on a regular basis. The monasteries following the Rule of Cluny really formed these Benedictines into an “order” because of a centralized authority system and the appointment of superiors in the priories (versus the typical election of a superior found in Benedictinism). Thus, he ensured that decadence that has a habit of creeping into a monk’s life was averted. Saint Odilo has several possible dates for his liturgical memorial: January 1, 2, or 3; 19 at Cluny; April 29 as part of the feast of the Seven Abbots of Cluny and February 6 in Switzerland. Take your pick. But I think, generally, Odilo’s liturgical memorial is bridged with under the title of “Abbots of Cluny” on April 29. If you ask monks and priests of an older generation about today’s Blessed, you will likely hear that he was a spiritual master and a man faithful to his vocation and the venerable theological teaching of the Church. You will hear people say that “Marmion is still alive and well and doing great things for people.” And in a certain real sense he is very alive with a new mission given to him by the Trinity. I “met” Dom Columba through friendship with a monk and also at the Illinois monastery named to honor him. 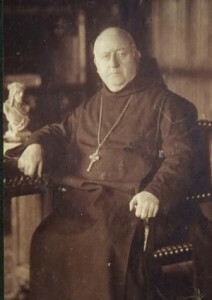 Dom Columba was abbot of Maredsous Abbey in Belgium. Ordained as a diocesan priest of Dublin, he entered the monastic life when he was 30, and by 28 September 1909 his brother monks elected him their abbot–a monastery of more than a 100 monks at the time; he served in that capacity until his death on January 30, 1923. Marmion authored three books based upon his extensive retreats. These works give a deep insight into his spirituality: Christ, the Life of the Soul (1917), Christ in His Mysteries (1919), and Christ the Ideal of the Monk (1922). His is a spirituality centered on Christ and our divine adoption as children of God. Translations of these works exist in many languages, and many consider them to be spiritual classics. I would like to remember in prayer my monk-friends at Marmion Abbey, Aurora, Illinois.